The first time I ordered this frame, I thought I must have chipped it struggling to get it out of the bubble wrap. I didn't complain becuase I wasn't sure that it wasn't my fault. Second time I ordered it, it was chipped again. This time I was very careful when I de-mummified it, so I know it wasn't me. It seems that any tiny little ding chips the esspresso color off and the red primer shows through. I've been painting over the chips as they occur, but I'm not real happy about it. Thank you for providing your feedback Wendy. That is very unfortunate that the 7PLT frame arrived chipped. Our packaging is well done to prevent the moulding from being damaged. Keep in mind we are willing to replace any merchandise that arrives in unsatisfactory condition. We will work with our carrier to make the necessary improvements. Thank you for your feedback. The back was disappointing with finger marks of stain all over. It wasn't finished at all. The color was so incredibly dark we assumed they sent black instead. The color is not truly represented on the site or in the catalog. I returned one, kept another to save time using it for an oil that can take the "almost black" color. I am still awaiting credit for the returned one and backing items. Takes a long time. Hello Lini. We sincerely apologize that the frame appeared darker than what you were expecting. Once you provide the photographs of the frame you have, we can determine if you received the correct frame. Our goal is to capture the best images of our frames for advertising. Please take advantage of our free samples that can be sent before you place an order with us. We also apologize for the finger marks that appeared on the back of the frame. In regards to you being reimbursed, the entire refund has been submitted. Thank you for allowing us to resolve this issue with you over the phone today. Have a great day. This frame suits most paintings of mine. Great value and looks more expensive than it is. These frames are solid and the stain is even. If anything I would say that they are blacker than what shows in the picture, with a little bit of dark red showing through in places. Make sure you measure the frame before having glass cut, if you are using glass as the allowance is a little tight. 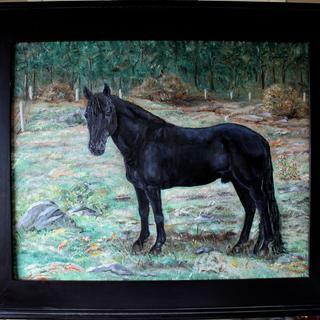 The frame is well made, easy to use and looks great. Good frame at an attractive price. Customer service is very good. Nice frame at a good price point. This is already in the gallery that handles my work. I frame about 30 works a year and am finding that your plein air frames are superb. I find myself using you as a source for frames more often. On this frame, it would be nice if the brown coloring were not quite so thickly opaque. First of all, let me say this frame was on clearance, so that may be why it arrived with a chunk of wood out of the back. I debated whether to return it, but from the front it looks fine so I'm keeping it. This was not for a commissioned piece. Hi Faith. Thank you for your review. We regret to hear that frame arrive this way. This is certainly not the experience we wish to leave with you. Our customer care team is always happy to make things right for you by issuing either a replacement frame or a return label for you. They are available Monday-Friday 8am-7pm eastern time and can be reached at 1-800-332-8884. Thank you again and have a great day! Neutral and shows off the work. 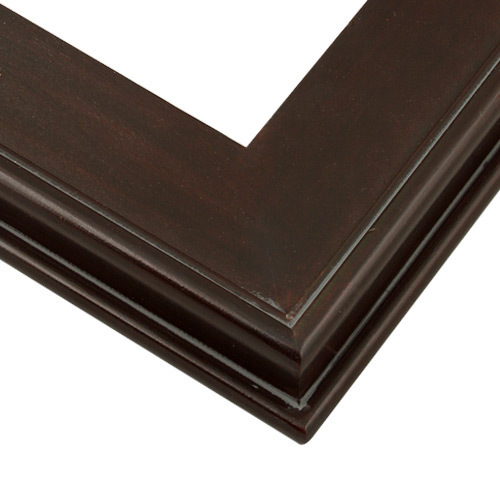 This frame has a nice wide molding and clean lines. The dark color sets off my canvases beautifully. The color and style will look good with the painting I chose it for.